Music is a powerful tool of the Spirit. The purpose of music at Women's Conference is to invite the Holy Ghost to be in attendance, and can not only touch the hearts of the sisters, but can also be an important source of inspiration and revelation. Thank you for being a part of this year's committee and assisting with this most vital part of our program. The following information and resources will be a help to you. Remember the committee is always here as a sounding board and support as you plan. You are not limited to hymns and sacrament meeting type music for Women's Conference. Of course our first priority is to invite the spirit to confirm truth through the music we share. However, there is music that may be a bit more contemporary that you feel is inspirational and appropriate. We don't want to go too far out there, but some flexibility is possible at this type of event. As you plan and share music with the Instant Choir, please be mindful and aware of copyrights. While free downloadable music is a wonderful resource, there is budget money enough for you to purchase music as necessary. Send your email address to the WEBMASTER before registration opens so it can be added to the Conference Music Contact form on the music webpage. You will then receive emails when sisters indicate interest to participte in music of the conference. Choose 2 choir numbers and determine how best to share that music with the Instant Choir members prior to the conference (either by email or posting the music on the website if it is free music). We respect copyright laws and do not want you to incur personal expense, so there is budget money available if you need to purchase music for the choir or other musical numbers. Keep your receipts and submit them to the treasurer upon arrival at the conference (or contact the committee chair if that doesn't work for you). Organize 2-3 special musical numbers. These can solos, duets, or other small group numbers. Can include instruments or instrumental solos. Discuss accompaniasts for these groups. It can work well to ask a willing sister to organize a small group from sisters in her area who will be attending. ​Decide and invite accompanists and conductors as needed (see helpful tips above). We encourage involving as many sisters as you fee comfortable inviting. You are welcome to use both the piano or organ. Contact all sisters who have signed up for the Instant Choir and provide them with copies of the music or links where they can download the music if available. Inform them of the two 1 hr rehearsals schedule. 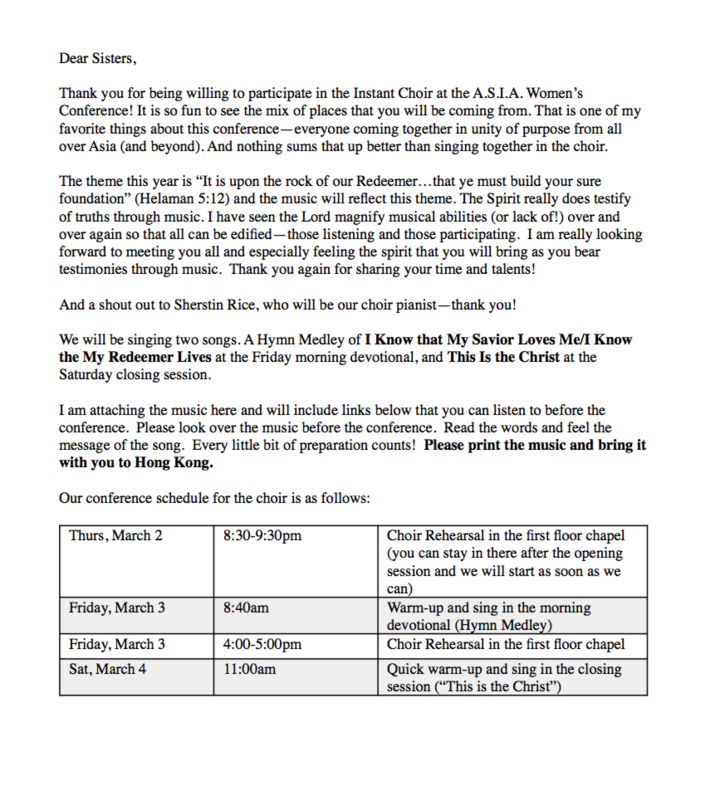 Send email reminder to the choir sisters to review their music prior to coming to the conference, and bring a printed copy with them. 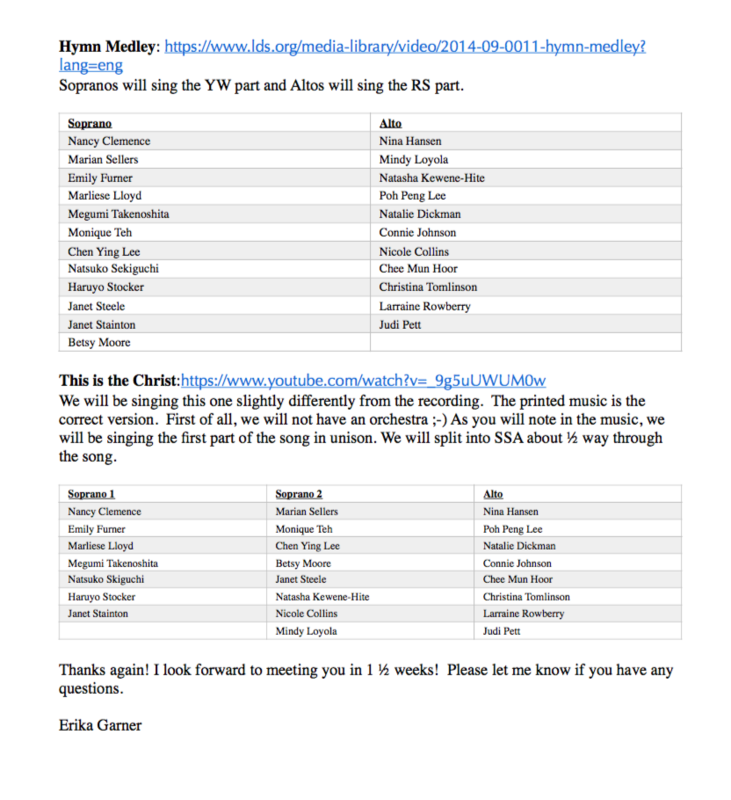 Send a final email reminder to the choir sisters to review their music prior to coming to the conference and to bring a printed copy with them. Prepare and bring 10 extra copies of the choir pieces for sisters who forget to bring them, or for those who decide to join at the last minute. Sisters can always share if they need to. Ensure that all organists, pianists and choristers are in place for general sessions. Including pre and postlude music and hymn numbers posted on the board. 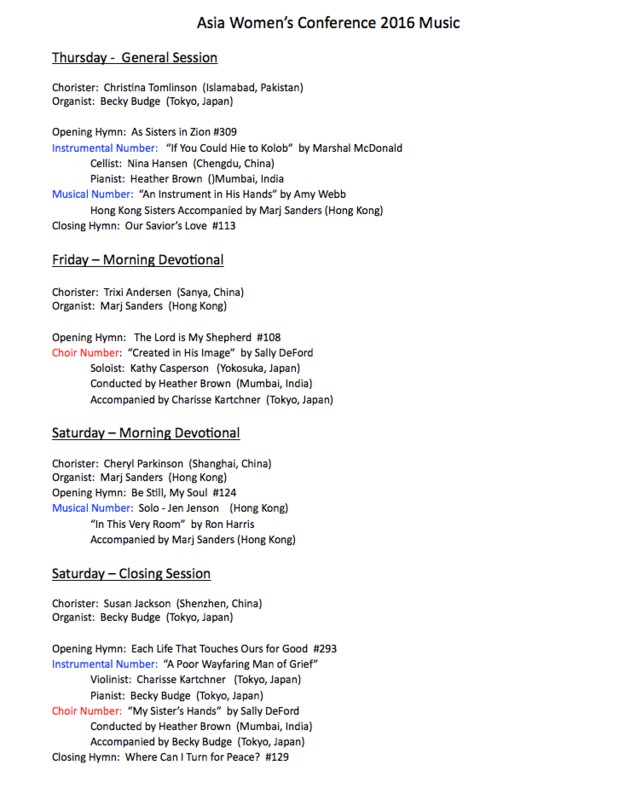 Update the Conference Music History spreadsheet (follow the same format) the information from the current year. CLICK HERE to open the file with the history of A.S.I.A Women's Conference music. You can see what choir and small group/solo numbers have been performed in the past, as well as how many numbers were arranged and for which sessions. It includes accompanists and conductors. It also includes hymns sung in the general sessions from each year. This should be helpful in your planning not only for ideas for scheduling, but also as a resource of names of musical people that have helped in previous years. This is the same document that we ask you to update with your current year's music after conference. It was very helpful to play the parts separately on the piano, and then the accompaniment for the sisters to practice learning the music. I sent it via email to each sister along with the paper music. I did purchase one of the songs and received stickers to place on their copies which authenticated the music. We sang three songs, one moderately difficult with three parts, which they managed very well by addressing the difficult spots first, even before sight-reading the music. The next two songs were much easier. Another thing that was helpful was to have the person in charge announce for the attendees to exit the chapel rapidly so that the choir could begin practicing right away. It was difficult to put people from different areas together to form a small group number and have enough practice time at the conference. I suggest to change the form to “I am willing to organize a small group number with sisters from my area.” Accompanists can be provided if needed. It may be harder for sisters to find a pianist who is coming to conference, so we can offer to set them up with a sister who volunteered to play the piano. I did that this year and it was pretty simple to run through it a couple of times and it was performance ready. If possible try to ensure the choir is able to get their full 1 hr practice slots. The Lord certainly blesses our Best efforts, even if it's only 45 minutes, but the full time allotment would have taken a bit of the pressure off. In addition, keep in mind that you only have one hour to put the song together. Some sisters will have practice before hand, and some will have not. Two songs that can be quickly learned and put together but that sound beautiful! Scheduling the location of the choir rehearsal is important. It took almost 20 minutes after the close of the Thursday night session for sisters to make it to the choir practice room which was on the fifth floor, and by the time many of them had arrived we had already started. Then we ended up going back down to the first floor chapel to figure out where to stand and practice in the actual space. That also took up precious minutes of rehearsal time.